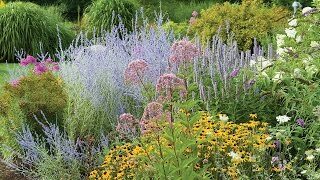 A staple for pretty blue color in the perennial garden. Scabiosa columbaria Butterfly Blue produces a bounty of 2" pincushion-type flowers that attract butterflies and are insect and disease resistant. Blooms from May to frost. Ideal for edging, containers or cutting and is beautiful with daylily Stella de Oro. Grow in full sun in average soil with excellent drainage, where plants can be spaced 12" apart. For continuous blooming, keep scabiosa deadheaded. Scabiosa, Butterfly Blue is rated 4.5 out of 5 by 10. Rated 5 out of 5 by MB22 from Beautiful! The scabiosas plant withstand the winter very well and are bloomimg furiously! 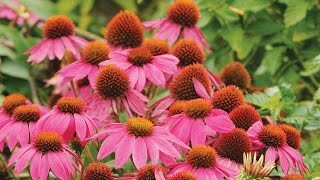 Rated 5 out of 5 by Bearpaws from Butterflies love these plants These plants have brought so many new butterflies into out yard, with the added bonus of bumblebees. I love the hundreds of bumbles darting around. Rated 1 out of 5 by Tom in Pittsburgh from They are dying I purchased among others; five (5) Scabiosa, Butterfly Blue planta last fall. They came well packaged, and alive. Some were bigger than others. I planted them the same day they arrived. This spring they came up but then slowly four of them started to develop brownish yellow leaves and two already died. The fifth plant in the same flower bed is growing great, healthy and has numerous flower bulbs on it. Do not know why four out of five plants did not make it. Rated 5 out of 5 by Kym99212 from Coming back this year! A nice compact accent plant that the bees love. I have three and now want more! Rated 5 out of 5 by Anonymous from Beautiful Flowers I purchased one of these plants, it keeps on blooming, and this is the first year I planed it. I just ordered three more plants I like it so much. Rated 5 out of 5 by NJPlantLover from Never disappoints This flower does great in full sun in my NJ garden and survives the winters without fail. After three years it has multiplied and I was able to transplant into other areas of my garden. What a wonderful reliable plant! Rated 4 out of 5 by brooklynbon from Butterfly Blue Beautiful This was a wonderful addition to my new garden and I gave it a place right in front.